Click here to read more about this linky party. And, hey! we are glad you are joining us if you are new to our linky party. We have a very talented group of regulars around here and a big thanks to everyone who has added the below button to their blog to help spread the word. Note: I added February's linky themes on my sidebar for your convenience. Today's theme is Nine-Patch Quilts. 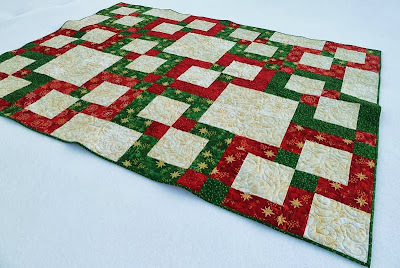 While getting ready for this week's linky, I found myself searching through archives and found this one in Deb's who blogs at A Simple Life Quilts from February of 2013. I love the dark purple contrasted with the lime green! And those daisies on the back are irresisable don't ya think!! You can read more about her quilting of this quilt right here. And here's a Disappearing Nine Patch inspired by Deb created by Jasmine who quilts at Quilt Kisses. Ooooh......so in love with that purple and green pretty!! I do hope you are taking it easy, Val. Such a classic block. Thanks for hosting the Tuesday Archive, I relearn something every week! So fun to be featured. I'm glad to hear you are resting up. I love this traditional block and it has such variety with color, placement, and setting with various alternating blocks. Should be fun to see what is posted. Thanks for the party Valery! Take care. Thanks for hosting, this is my first time participating & I look fwd to visiting links! Even though I knew it was coming it still startled me to see that quilt pop up in Feedly today! LOL I love purple with most anything but that lime combo was a good one. Thanks Val. I know I'm learning a lot from the variety of nine patches posted this week! !